The Woman in Black is a tale which is so ingrained in popular culture that even the mention of its name has people jumping behind their sofas in fear. Originally published as a novella in 1983 by author Susan Hill, the story was later adapted into a stage play by Stephen Mallatratt. The play opened in London in 1989 where it has played ever since. Not content with having terrified audiences in London for 27 years, the production is currently touring the UK for over the dozenth time, and chilling audiences up and down the country in the process. The story is framed as a play within a play. Set inside a Victorian theatre, an elderly lawyer named Arthur Kipps seeks out the the assistance of a young actor to help him tell a story which he's kept to himself for many years. Despite Kipp's initial resistance to the idea of staging his horrific tale in the form of a play for entertainment's sake, he eventually relents and allows the young actor to assume the role of Kipps in the retelling, while Kipps himself takes on the supporting roles within the story. The audience is then transported back to many years before, and the story of The Woman in Black begins. It is revealed that the woman is a ghostly presence which resides within the neglected grounds of Eel Marsh House, in the North Eastern town of Crythin Gifford. Kipps recalls a time many years ago when he was sent to the bleak town to attend the funeral of a client, Mrs Alice Drablow, and to get all of her papers in order. However, upon his arrival he senses a feeling of foreboding in the town, and soon discovers why. Alice Drablow's house is seemingly haunted by a mysterious woman with a wasted face, dressed all in black, whose presence signifies an unspeakable danger to all those residing in Crythin Gifford! The play is executed well by actors David Acton as Kipps and Matthew Spencer as The Actor. Their ability to evoke a sense of uneasiness and dread is paramount to the success of the play, and they exercise incredible stamina in the roles, sustaining just enough tension throughout to ensure that the finale is an intense and jarring explosion of terror. An amazing feat for two actors who spend the majority of the play alone on an almost bare stage. Of course, they are aided by shapes and shadows half seen, noises half heard, and the audience's imagination itself. Half of the fun and horror of The Woman in Black is trying to establish what is real and what is just a trick of the light or senses being mislead. The production does therefore make great use of lighting and sound design. Despite most of the action taking place on a stage adorned with just a coat rack, stool as wicker basket, the production uses a gauze to cleverly convey the shadowy crevices of Eel Marsh House. 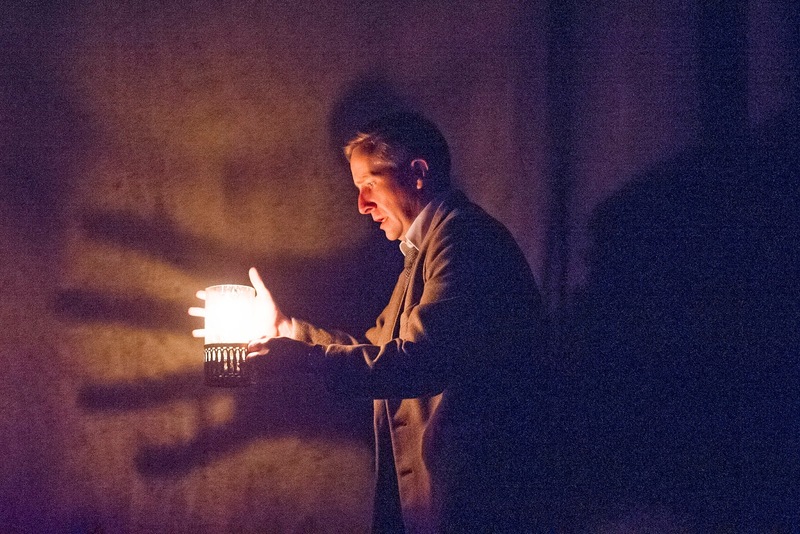 The stage magic seen in The Woman in Black is delightfully archaic and helps to plant the production clearly within the Victorian era. It's a nice touch to see Kipps and The Actor marvel at recorded sound playing in the theatre, and indeed the sound design, while simplistic, is very effective. In fact The Woman in Black is at its spookiest when it's at its subtlest. The sound of a rocking chair listing rhythmically in the next room, the mystery of an ominous locked door, and the haunting screams of ghostly unseen figures all cause an eeriness which is much more unsettling than any sighting of the woman herself. Nevertheless, some outright jump scares also serve to startle. Although at some points the scares do seem a little bit obvious, there's no denying that The Woman in Black is a chilling night out with jumps aplenty and an ending which will send a shivers down the spine! The Woman in Black is currently playing in London's Fortune Theatre as well as touring the UK. For more information on tour dates and to book tickets visit the show's website.